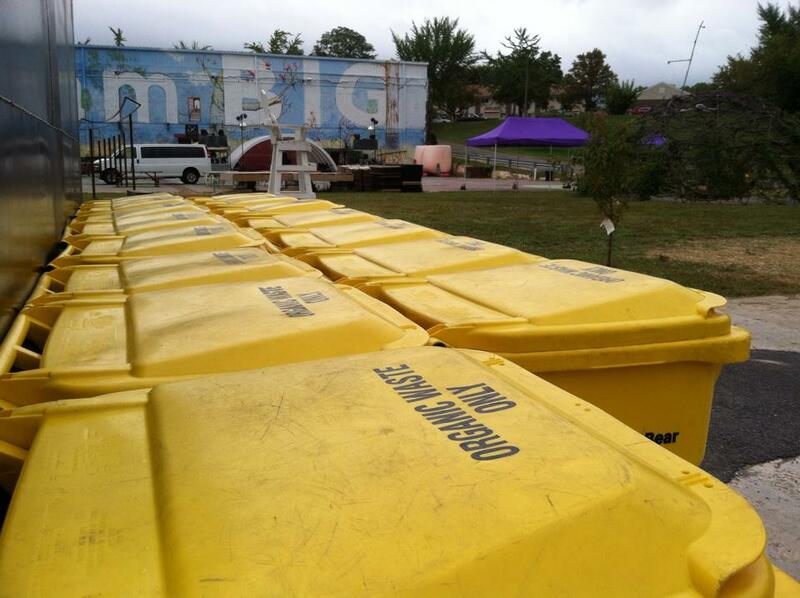 The rainy weather didn’t stop the GreenBlue team from diverting waste from the landfill at a local music festival in Charlottesville, Va earlier this month . GreenBlue approached the Tom Tom Fall Block Party organizers to start a composting initiative at one of the biggest festivals in Charlottesville. Luckily the festival was open to the proposal and GreenBlue was able to work with local composting hauler, Black Bear Composting, to begin collecting food waste, paper products, and compostable foodservice products from Tom Tom Fall Block Party. We at GreenBlue love sharing our passion with the community and getting to do on-the-ground environmental work. During the two-day event, we collected eight 65-gallon bins of materials that totaled up to 240 pounds of diverted waste! With the help of a couple dedicated volunteers we were able to not only help compost at the festival, but also educate the community about what composting is, why it’s important, and what items are compostable. We have high hopes that we will be able to continue scaling up composting efforts in our hometown in tandem with the successful Scaling up Composting in Charlotte pilot project that is wrapping up this month.